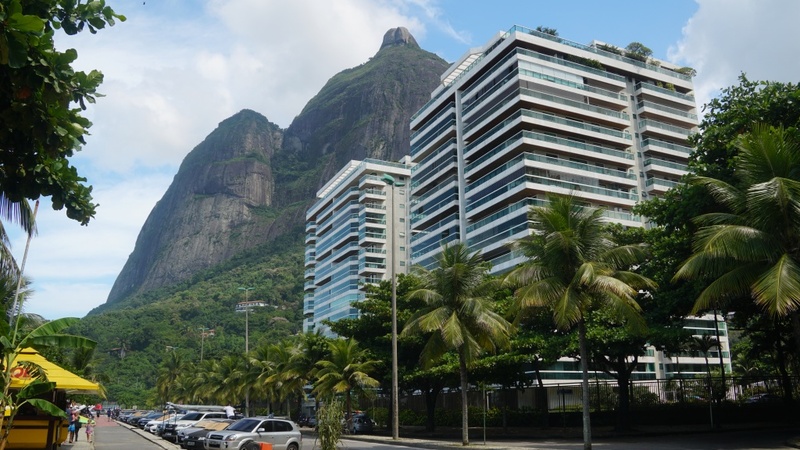 The buildings and mountains come right down to the beach. It’s a bit like Waikiki, only longer, bigger, wider. 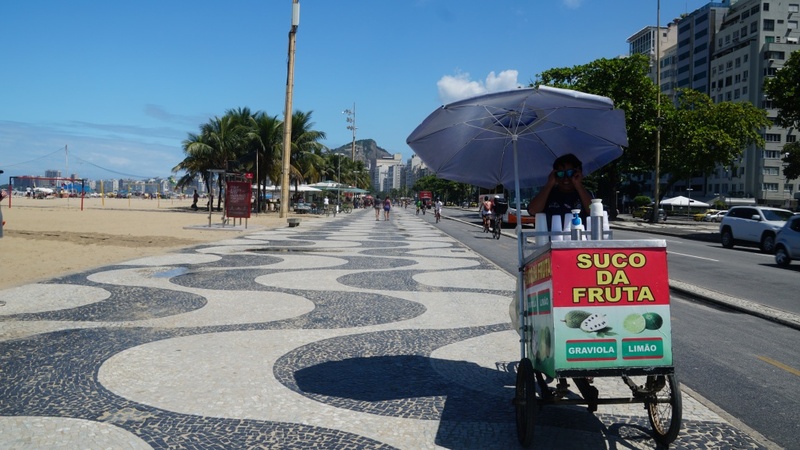 The entire length of the Copacabana promenade is a black and white geometric wave, designed in 1930 with hotels, bars, restaurants, night clubs, and residential buildings across the street. 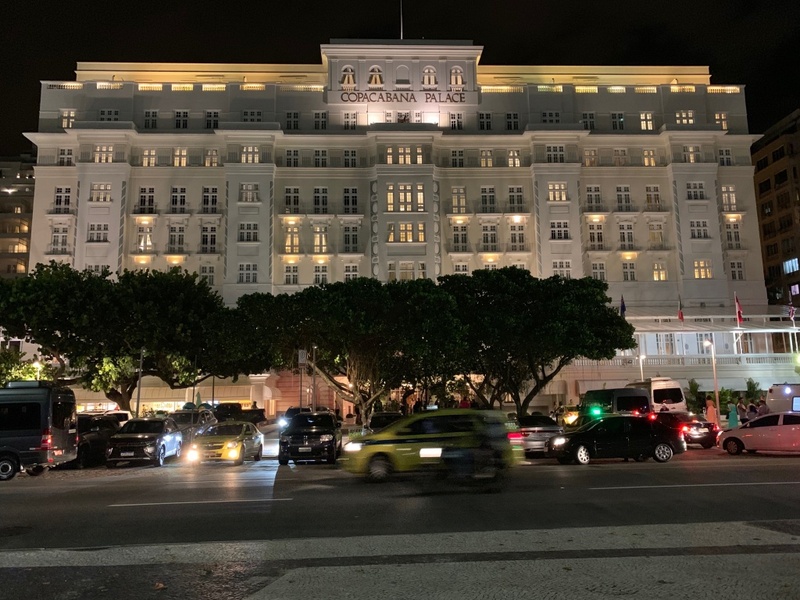 The most famous hotel on the strip is Copacabana Palace. 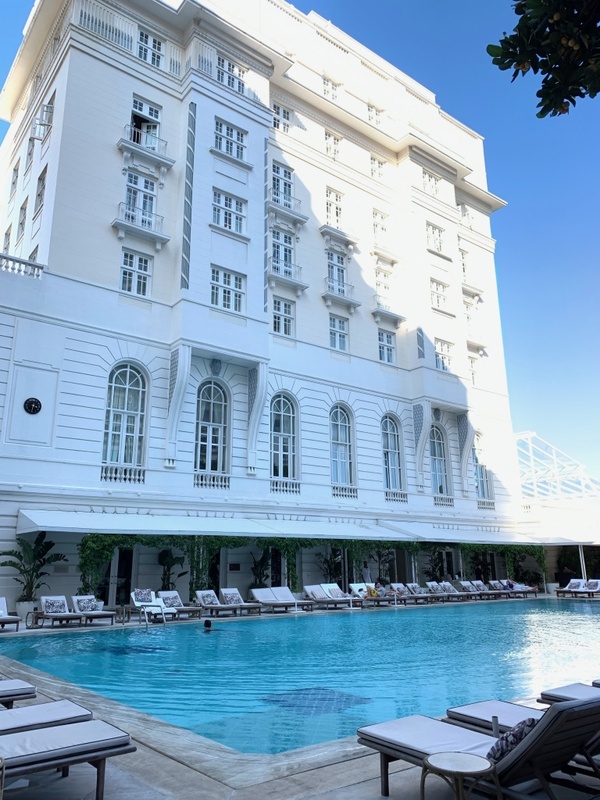 Built in 1923, it has a reputation for being the best hotel in South America, with a long list of international celebrities on their guest list including Mick Jagger, Madonna, Princess Di, and Marilyn Monroe. We stayed right next door. Haha!! I’m pretty sure it was a lot more reasonable, with the same view. Don’t forget to stop by Momo’s, their famous gelato/ice cream parlor at the street level, where everyone can afford a refreshing treat as a respite from the warm sun. 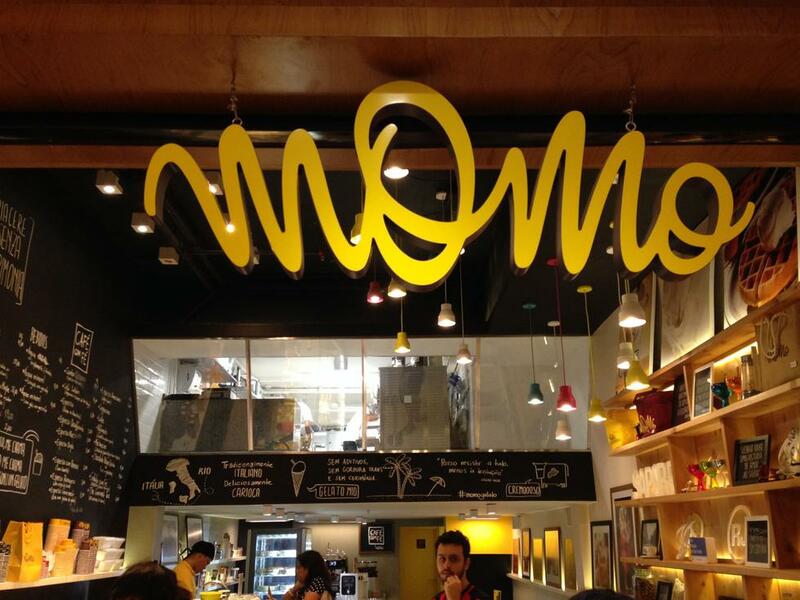 Momo’s…great for an ice cream break! 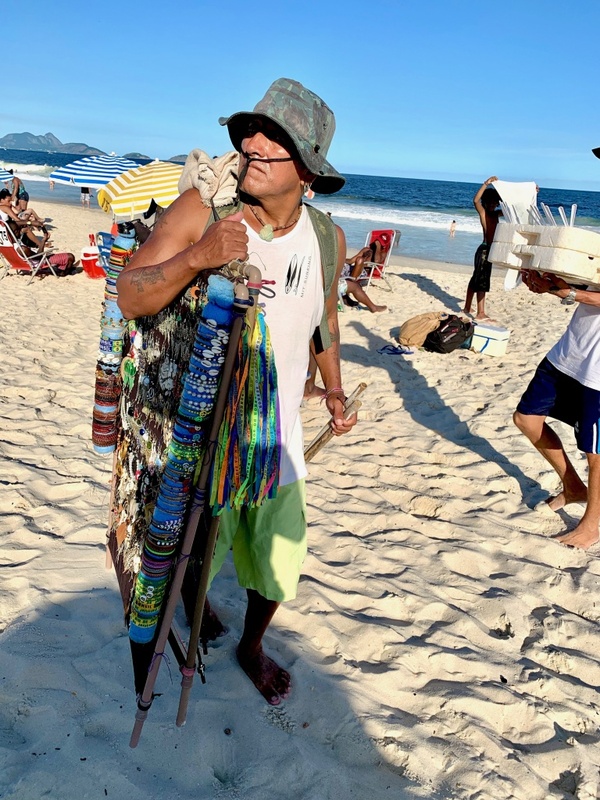 The beach in Rio is more than just a beach…for these people, it’s a lifestyle. Everyone goes to the beach, often! It’s packed, even on a Monday. Livin’ it up on the beach! All you have to do is get yourself a beach chair, a towel, and an umbrella and the rest comes to you without you even getting out of your chair. There are lots of people selling empanadas, BBQ’ed cheese on a stick (delicious! by the way…), sandwiches, drinks, ice cream bars, cotton candy, cocktails, you name it. 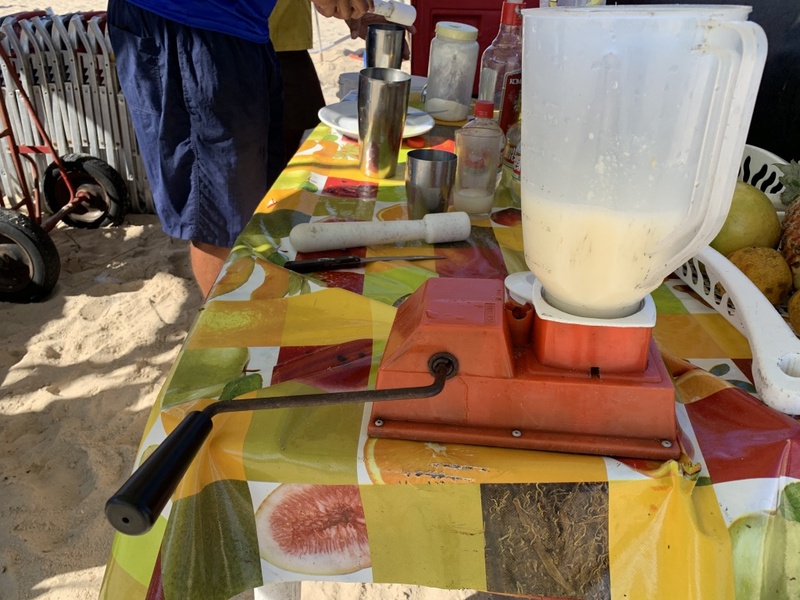 Rio is known for their famous drink, a caipirinha, and there are drink stands down the entire beach making fruit smoothies and their famous mixed concoctions. 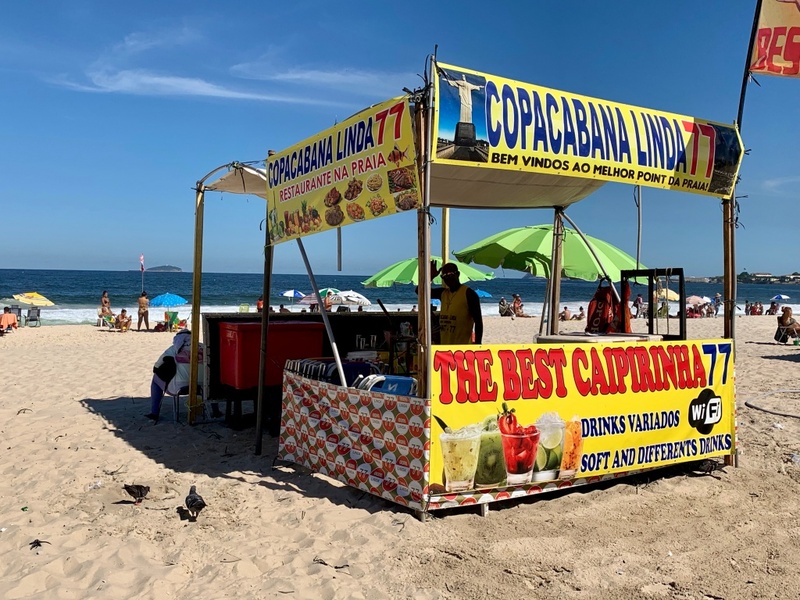 77 means stand #77 on the beach stretch…there must be 100s of these along this 2.5 mile stretch. 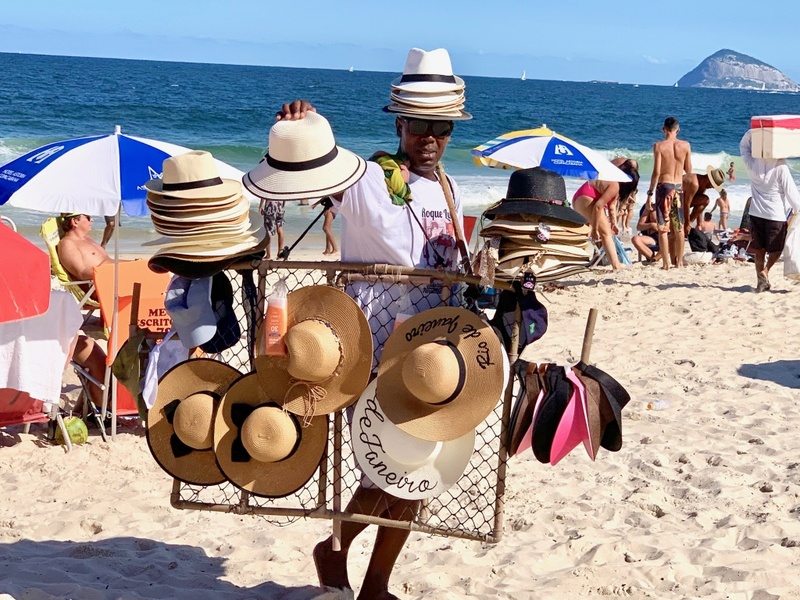 You can even get your souvenir shopping done from the comfort of your beach chair. These guys sell everything. I don’t know how they carry all this and parade up and down on the hot sun all day long. They are motivated sellers and bargaining is certainly part of the game. They even sell swim suits. 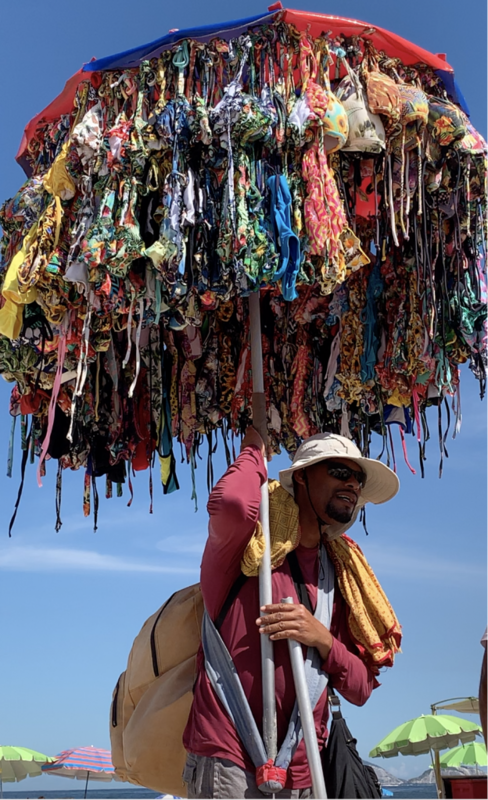 I really admired this guy…carrying all of these has got to be heavy!! 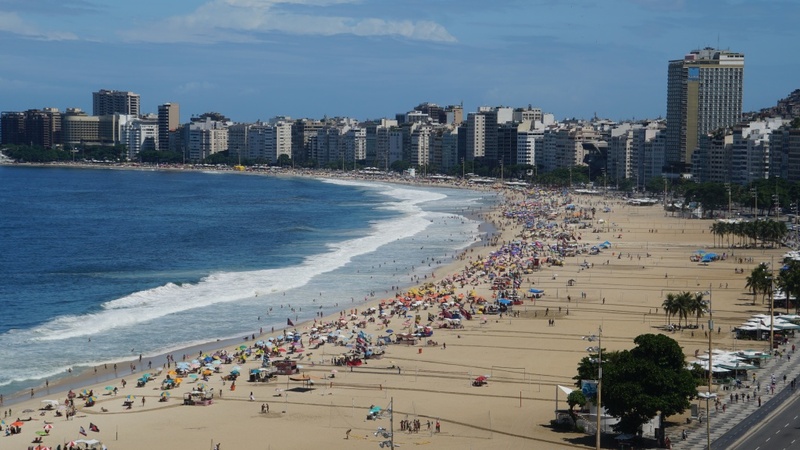 What do you think a swim suit cost in Rio? Would you believe twelve dollars!? What a bargain! 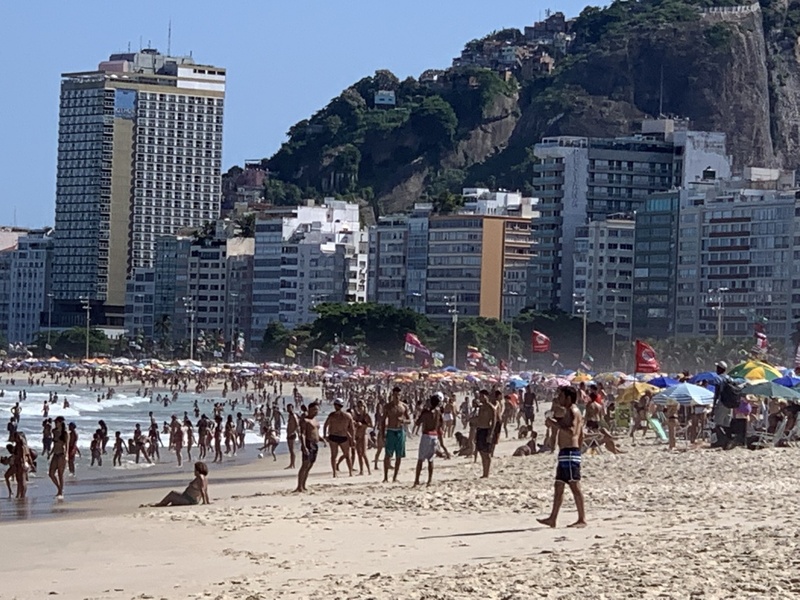 Although, the bottoms are pretty skimpy…but that’s the style here in Rio. We’ve got you covered for swimsuits! 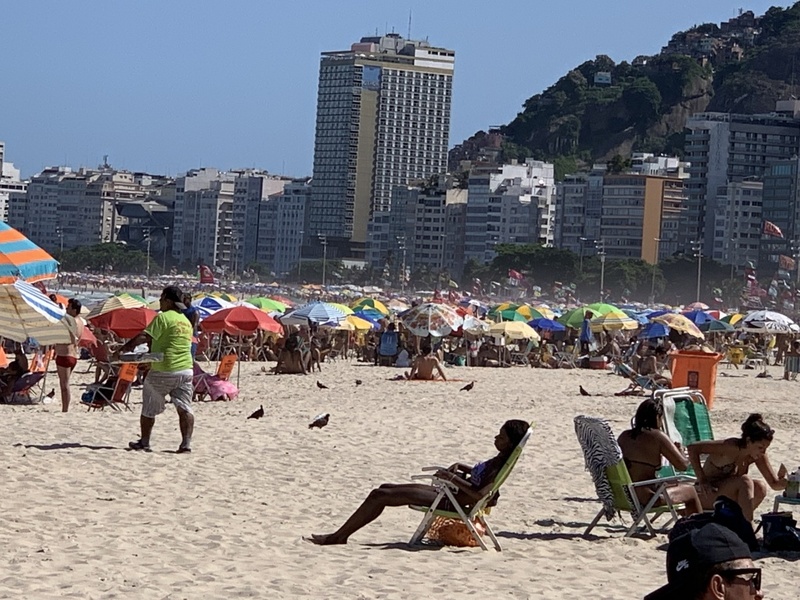 It’s pretty darn relaxing at the beach in Rio. 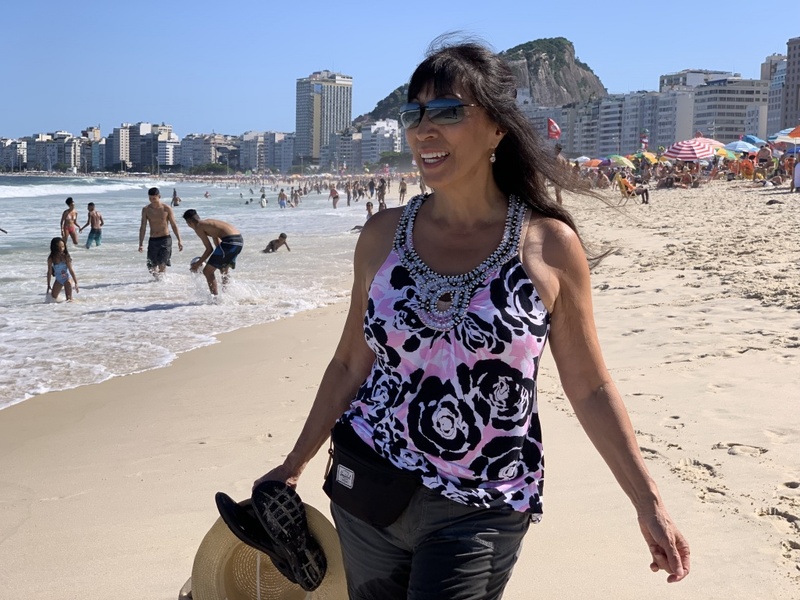 The sand is beautiful, the water is really warm, there’s lots of food and snacks on the beach, and the weather is a perfect 80 degrees. 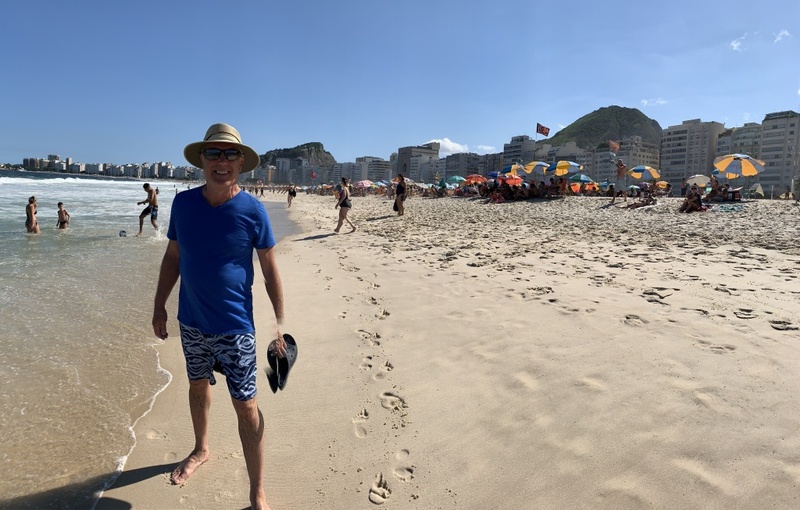 This is a great way to spend an afternoon, at the beach in Rio. 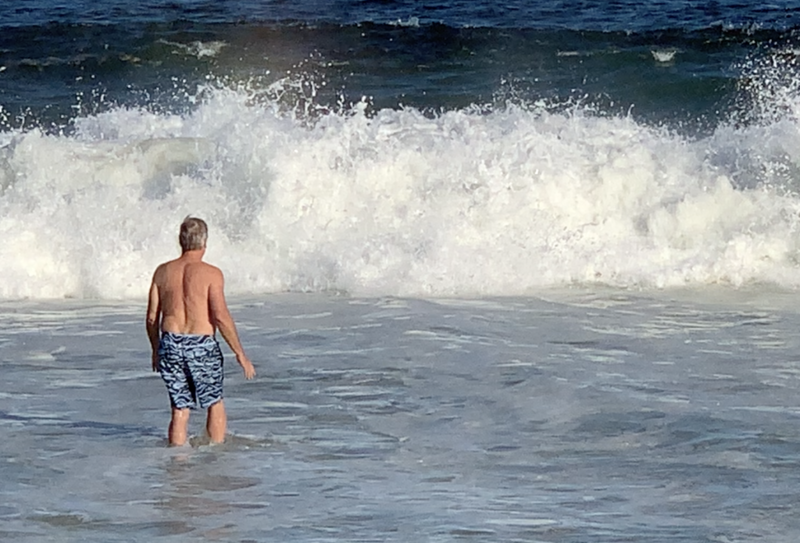 Whoa…those waves are pretty big so close to shore! 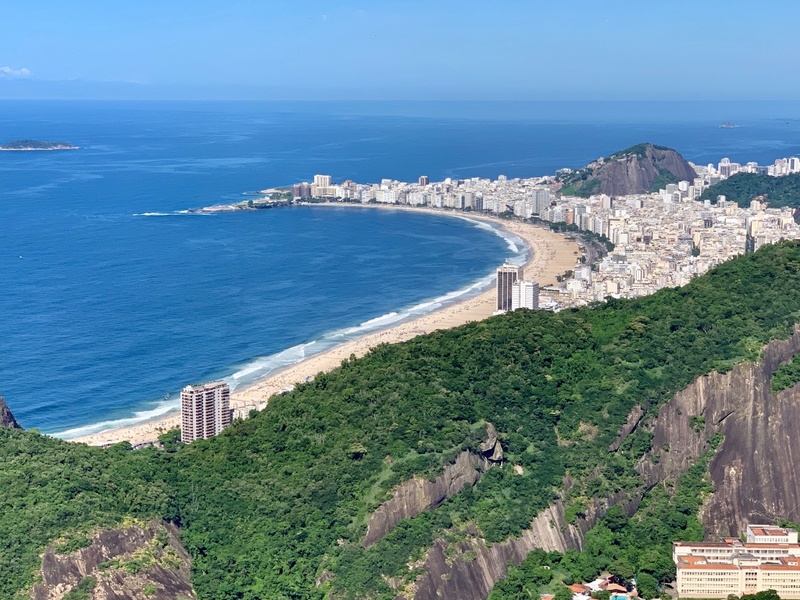 Thanks to Gate 1 for another amazing adventure through some of the nicest cities of South America. We made some wonderful new friends and saw some amazing things. 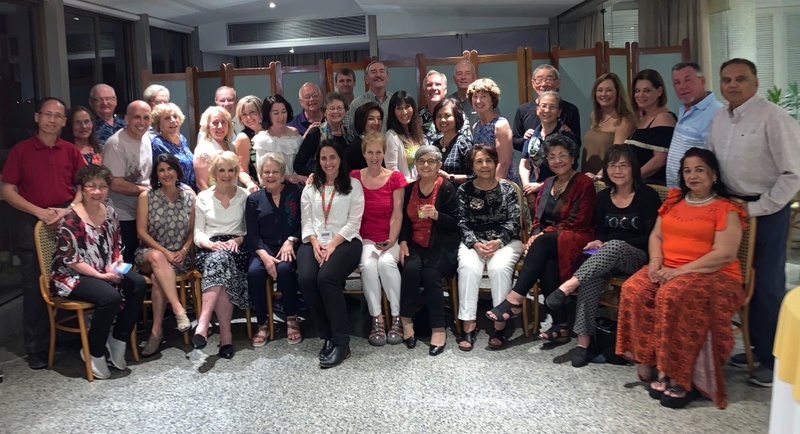 Thanks also to you, my friends, that have been traveling along this journey with us! We hope you enjoyed it too! We will be checking in with you on another adventure soon. Muchas gracias, obrigada, thank you, thank you, for the wonderful pictures, posts etc., etc., etc.!!! You’re welcome Doris! Glad you’re following along!